This painting is one of nine canvases known as The Triumphs of Caesar, which can be counted amongst the finest achievements in Italian Renaissance art. They were probably painted for Franceso II Gonzaga (1466-1519), who became the 4th Marquis of Mantua in 1484. 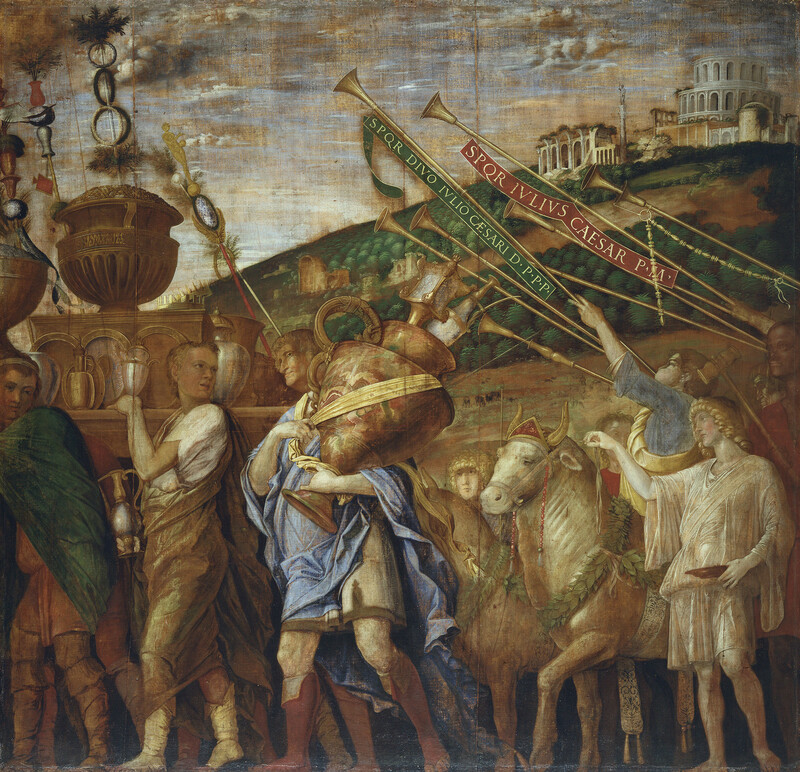 The nine paintings form a sequence, which should really be called the 'Triumph of Caesar', because it depicts a single procession, culminating in this final episode - the arrival of Julius Caesar borne on a chariot passing in front of a triumphal arch. The procession cannot be connected with a particular campaign, which is probably why it was seen more generally to celebrate the triumphs of Julius Caesar (c.102-44 BC), an ancient Roman soldier, statesman and historian revered during the Renaissance. Mantegna could have consulted a number of writers, such as Suetonius, Plutarch and Appian, all of whom include descriptions of triumphs and were available during the Renaissance in manuscript or printed forms. He would have also referred to Roman antiquities, particularly monumental arches and columns, which he would have known through drawn sources. Triumphs of Caesar were acquired by Charles I in 1629 when he purchased a large part of the collections formed by the Gonzaga family. They were clearly then considered to be the masterpiece of the collection. The canvases have been hung at Hampton Court since the probable date of their arrival in England in 1630, and tapestries based on some of the scenes were woven at the Mortlake factory.